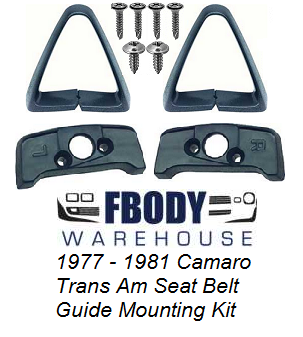 This is a complete seat belt guide mounting set for 1970-1981 Camaro and Trans Am with Triangle shaped seat belt guides. 2 NEW reproduction seat belt guide triangle mounting screws. This full kit includes everything you will need! Use the drop down menus for shipping world wide! 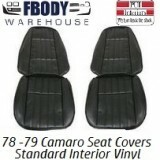 Need these in a specific color? We will redye and clear coat all units to your exact color needs! Use the drop down menu below to select color needs! (NOTE) Triangles come in black and bases come in dark blue if you do not select any redye service. We use only SEM Interior Dyes giving you the best results in the industry! 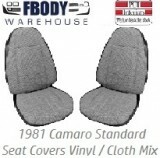 1973 - 1981 Front Seat Belt Female Sleeve Covers 5 Available Colors! 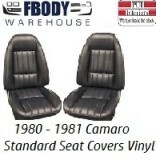 * 1972 - 1981 Camaro Trans Am Seat Bottom Springs NEW Replacement!